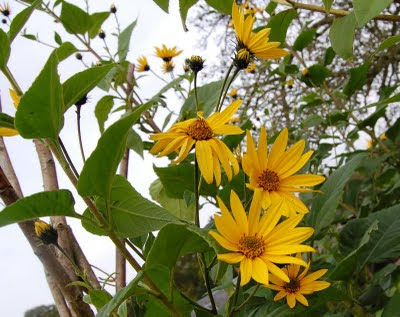 Winter hardy vegetables don't come much easier than the Jerusalem Artichoke, also known as the Sunchoke in America or topinambour in French. Stick them in the ground in spring and stand back as they shoot up at speed. They overwinter in the ground and can be dug as needed or taken and stored in the fridge for several weeks if the ground is likely to freeze hard. Once you have them you never lose them either, so no matter how thoroughly you clean the ground after harvest expect to find new plants popping up in the spring. Because of this many people set aside a patch for a permanent bed for them rather than risk seeding their entire garden with knobbly tubers. But despite their reputation as hardy thugs and incipient vermin they are a gentle sort of beast. They don't sting, scratch or induce allergy easily and if they are in the wrong place simply removing all the foliage for a month or three will sort them out. Although they are mostly pest and disease free (deer will nibble the tops, but then what won't they nibble?) they benefit from moving onto a new patch regularly if you have the space. 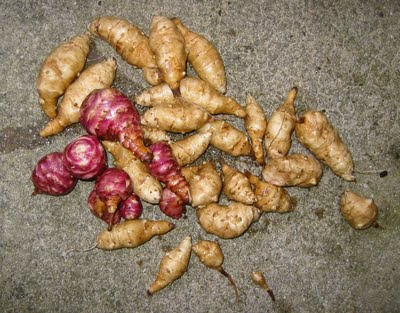 Digging tubers from a new row is infinitely more rewarding in terms of tuber shape and the crop is concentrated around the plant stem making it easier to remove tiddlers that might otherwise form unwanted volunteers the next year. If you have to keep them to a permanent patch, thorough cultivation and light feeding every other year is recommended. We now have two varieties, the stumpier round red one was originally obtained in Waitrose many years ago. It grows tall but never flowers and if you leave the tubers in the ground too long they become impressively knobbly and difficult to peel. We get around this by scrubbing them well and cooking them in their skins. The soft pulp is then easy to remove and make soup with or mash into the potatoes. The skin isn't hard anyway but the texture isn't always welcome. The longer whiter variety came from Sainsburys. A small rant of mine is that supermarkets never identify vegetables properly but these appear to be of the Fuseau type. This was the first year we've grown them and I was impressed with the yield compared to the red ones. 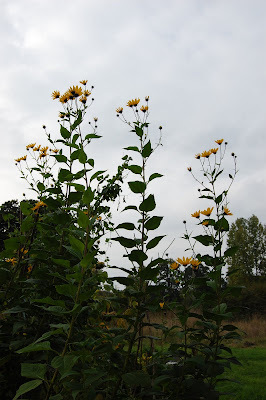 On the other hand, there's a limit to amount of Jerusalem artichokes anyone can eat so perhaps a big harvest isn't the significant indicator of quality. This sort also flower which is a bonus on the vegetable patch in the early autumn. They can be eaten cooked or raw and are, I think, best cooked with lemon and oil in the Turkish style. The flavour is quite sweet and smoky and also goes well in soups and stews. There is one unavoidable issue with them as a human food crop. They contain the sugar inulin, which most people are unable to digest. This makes them a low calorie food but also means that it's a very windy one. For this reason we eat very little of our crop most years although because they are so easy and prolific they are a valuable famine food for years when stocks of other more digestible vegetables run low. Never eaten them and never grown them, so a perfect crop to trial next year!. Love to trial new things, even when some turn out to be a disaster, all my purple sprouts blew the buttons this year wont be trying them again, but the Italian broc and butternut squash were amazing. Hi Fuzzlewoof, how's the family? They say you have to plant brussels sprouts really firmly - don't know if this is true or not as I'm rubbish at growing them. Glad you had good butternut squashes, I did better this year than every before but still only managed about six fruit from six plants - they really seem to want something (probably good weather!) that they're not getting. Get your JA's from a supermarket, much cheaper than buying them from seed merchants. Thanks for the tips, much appreciated, for the butternuts I find they like an open bit of ground with good sun (not guaranteed! ), I also dig a pit of manure for them and use cut open bottles to water and feed directly to the root and it seems to work well. The family are well thanks, it was the twin boys naming ceremony yesterday, can't wait to get them weeding on the lotty! I found some Jerusalem Artichokes in a local store for the first time. I had been searching for a year. I liked them! Why are they so expensive in seed catalogs?